The nearly 1.4 million American and Allied Prisoners of War in Germany and elsewhere were probably the most grateful beneficiaries of Red Cross services during World War 2. Many of them were lucky to return home alive because of the more than 27 million parcels prepared and shipped by the American Red Cross (ARC) to the International Red Cross Committee in Geneva, Switzerland, for distribution in the PW camps. Some 13,500 volunteers assembled the various packages in special centers in New York, Philadelphia, Chicago, and St. Louis. The first Prisoner of War packaging center already opened in Philadelphia in 1943, and the majority of these continued operating throughout 1945. 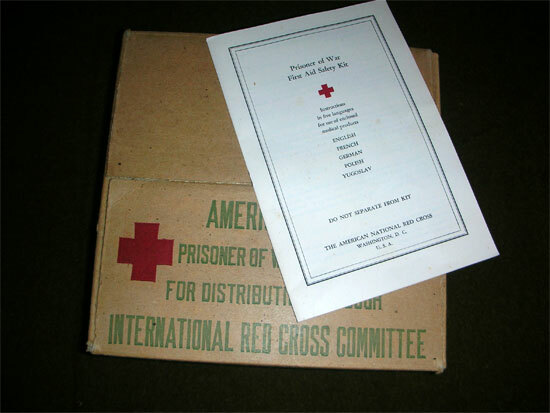 The “American Red Cross” provided, through the services of the International Red Cross Committee (IRCC), relief packages to help American PWs in enemy custody. These were sometimes equally distributed among other Allied prisoners, and in some cases helped ease the burden of civilian internees as well! Of course, it is known that in particular cases, these supplies were sometimes pilfered by the German guards or STALAG/OFLAG authorities and personnel. Another problem which affected the distribution of mail and packages arose toward the close of the war with the change in the overall military situation. The Allied liberation and occupation of France practically cut off German planes that used to fly daily from Lisbon, Portugal (neutral country), to Germany carrying air mail to Prisoners of War. Surface mail and next-of-kin parcels, which Red Cross ships formerly carried to Marseille, France, were stalled from June to October 1944. Fighting along the Marseille-Switzerland line made it almost impossible to move mail into or out of Switzerland (neutral country). In the meantime the numbers of American PWs tripled in number since June 1944. In August 1944, the American Red Cross in cooperation with the US Post Office moved all accumulated parcels and land mail to Sweden (neutral country). Two freight trains subsequently carried it by land and ferry from Sweden (Goteborg) to Germany (Lübeck) in September 1944. Meanwhile the US Army Post Office transported next-of-kin parcels to Marseille and Toulon by Army transport, and from there via Switzerland to Germany. After September all letter mail was regularly flown to Switzerland or Sweden, whence it was forwarded directly on to Germany. The continuous change in the frontlines, with camps suddenly moving further inland in Germany, resulted in temporary shortages of supplies. When such sudden movements occurred, large numbers of new PWs could unexpectedly arrive in certain camps increasing the existing number of inmates manifold. Stocks of goods would diminish rapidly causing temporary gaps before new supplies could be rushed to a particular camp. There was a consistent struggle for sufficient railroad cars which by arrangements between Swiss authorities and Germany were to be furnished by the German railroads. Of course the Germans gave first priority to their own military shipments. However, relief shipments were also sometimes delayed en route by the lack of military transportation means and by Allied bombings of railyards. 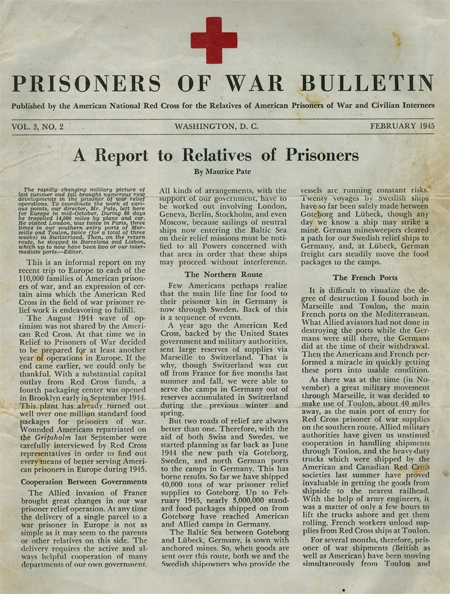 Copy of Prisoners of War Bulletin, Vol. 3, No. 2, February 1945, published by the American National Red Cross for the Relatives of American Prisoners of War and Civilian Internees, Washington 13, D.C., USA. The combined American, British, and Canadian Red Cross programs called for the movement of about 15,000 tons a month, but with the coming winter of 1944-45, the schedule was raised to 20,000 tons of supplies because exceptionally large amounts of clothing were also needed to be moved. 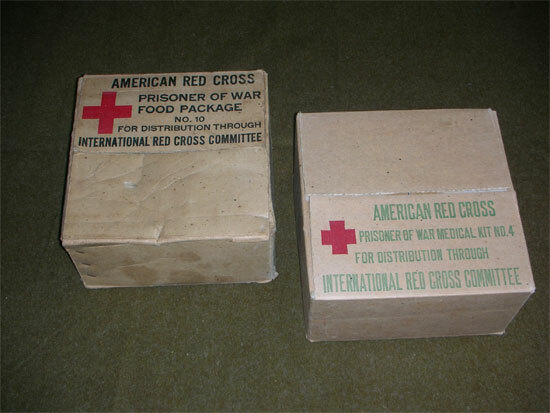 Most of the goods provided by the American Red Cross were food packages of a uniform size (10” x 10” x 4 ½”) and weight (11 lb) that contained such non-perishable items as prunes – raisins – liver pâté – coffee – corned beef – sugar – dried milk – oleomargarine – biscuits – orange concentrate – cheese – canned salmon or tuna fish – chocolate bars – cigarettes, and soap (official designation: American Red Cross, Prisoner of War Food Package, No. 10). 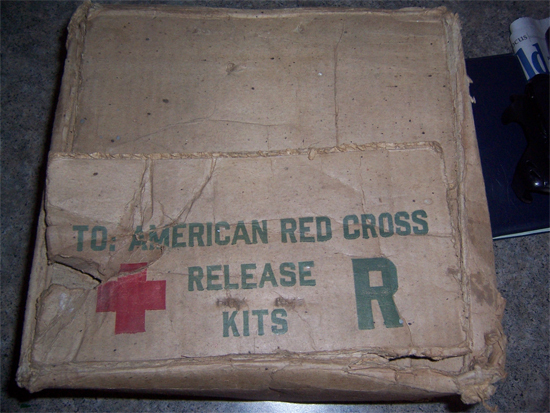 Other packages consisted of precious medical supplies, such as the American Red Cross, Prisoner of War Medical Kit No. 4, while some also held clothing, toilet articles, seeds, and gardening articles. In December 1944, the American Red Cross even provided Christmas Packages to PWs in Germany. More than 75,000 units were shipped from Philadelphia to Goteborg, together with large quantities of standard food packages and other supplies, and then transshipped on Swedish vessels to north Germany. Subject supplies included boned meat turkey – small sausages – strawberry jam – assorted candy – deviled ham – cheddar cheese – plum pudding – mixed nuts – bouillon cubes – fruit bars – dates – canned cherries – butter – honey – tea – cigarettes – smoking tobacco – pipes – chewing gum – playing cards – washcloths, and pictures of American scenery. Their official designation was: American Red Cross, Prisoner of War Package, Christmas Package No. 2. Copy of Prisoners of War Bulletin, Vol. 2, No. 12, Washington, D.C., December 1944, introducing the 1944 Christmas Package. In January 1945, the A.R.C. packed special kits to be given to American Prisoners of War when released by the Germans at the end of the war, and whenever they would be liberated in the Far East. A similar shipment had already gone to the Philippines. The kits were packed by women volunteers at the New York Packaging Center, and it was planned that each PW should receive one. Every effort would be made to get them to the men promptly upon their liberation. Each package contained a razor – razor blades – shaving cream – toothbrush – toothpaste – comb – socks – handkerchiefs – face cloth – stationery – pencil – book – playing cards – cigarette case with ARC emblem – hard candy – chewing gum. The different items were all packed into an olive drab cloth bag, similar to the ditty bags or comfort kits given to servicemen and women going overseas (official designation: American Red Cross, Release Kits R). Illustration showing the ARC Release Kit. American prisoners regularly received those relief packages in the PW camps located in Europe, but those in the Pacific Theaters did not due to the lack of Japanese cooperation. Some relief packages were shipped to Vladivostock and stored on site, until they could be picked up by Japanese vessels for possible distribution to the different prisoner camps in Japan and mainland Asia. The present Article is meant to give a more detailed aspect of some of the relief packages distributed among American Prisoners of War in enemy hands. Illustration showing the enclosed Instruction Sheet. The different languages are indicated on the front cover of the booklet. 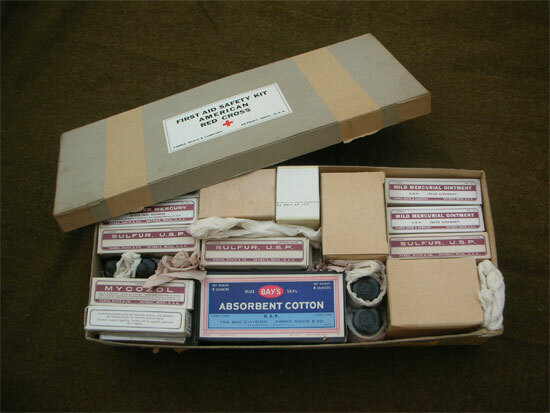 Another nomenclature for subject kit was: Prisoner of War First Aid Safety Kit. Inside the cardboard box was a 12-page booklet, which was to remain with the kit. It held instructions for use of the enclosed medical products in five (5) different languages, i.e. ENGLISH * FRENCH * GERMAN * POLISH * YUGOSLAV. The Kit was supplied by the American National Red Cross, Washington, D.C., U.S.A., and its reference was ARC 320, Rev. April 1944. 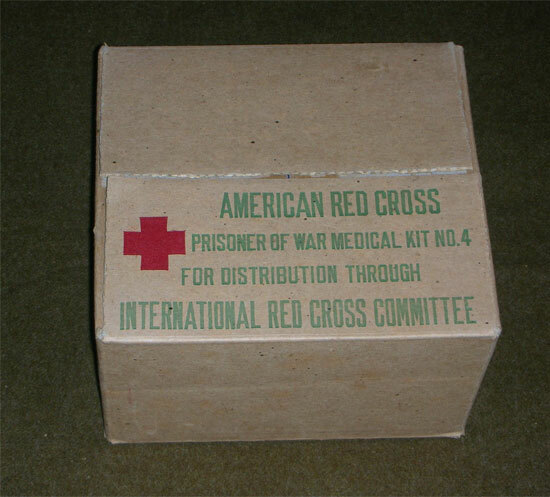 The Cardboard Box (10” x 10” x 5 ¼”) was marked (top or side) as follows: AMERICAN RED CROSS – (Red Cross symbol) PRISONER OF WAR MEDICAL KIT NO. 4 FOR DISTRIBUTION THROUGH INTERNATIONAL RED CROSS COMMITTEE (i.e. green block letters, except for the full Red Cross emblem). Close up image showing details of the cover of the 12-page instruction booklet, enclosed in every package and available in 5 different languages. The Medical Kit was designed to serve 100 men for a month or more. It contained practical, well-known remedies. Prisoners were invited to read the directions carefully and follow the instructions exactly. They were further instructed to avoid overdose, and secure the services of a physician whenever possible. 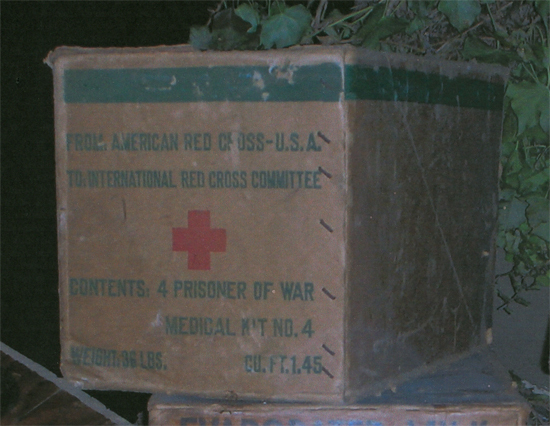 Illustration of outer cardboard box containing four (4) American Red Cross Prisoner of War Medical Kits No. 4. 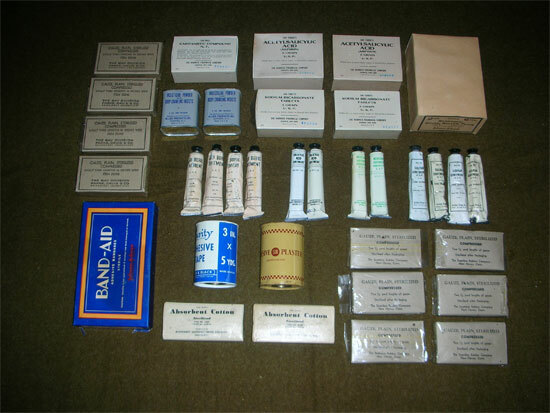 Contents of the Prisoner of War First Aid Kit No. 4 layout (see tentative list further below). 4 x Gauze, Plain, Sterilized, Compressed (1/2 yd x 36”) For dressing wounds, abrasions, burns, and cuts. 1 x Compound, Cathartic, Pill (500 x Pills) For laxative. Dose: 1 or 2 pills. 2 x Acid, Acetylsalicylic, Tablet (500 x Aspirin Tablets) For relief of aches, headache, and the reduction of fever. Dose: 1 to 3 tablets every 4 hours as necessary. 12 x Bandages, Gauze, Roller, Plain (2” x 6 yds in single box) For holding dressings or splints in place. 2 x Powder, Insecticide (2 Oz. Metal Can) For destruction of body, head, or crab lice, for prevention of chigger and tick bites. 4 x Acid, Boric, Ointment (1 Oz. Tube) For antiseptic treatment of burns, wounds, fissures, abrasions, etc. 2 x Sodium, Bicarbonate, Tablet (500 x Tablets) For gastric acidity. Dose: 1 or more tablets. 2 x Mercuric Ointment, Ammoniated (1 Oz. Tube) For antiseptic treatment of skin diseases. 4 x Sulfur Ointment (1 Oz. Tube) For parasitic treatment of skin diseases. 1 x Adhesive, Bandage, Sterile (100 x Adhesives 1” x 3” in single box – Band-Aid) For dressing small cuts and wounds. 2 x Plaster or Tape, Adhesive (3” x 5 yds) For holding dressings and to give support. 6 x Gauze, Plain, Sterilized, Compressed (Two 1/2 yard lengths of gauze) For dressing wounds, abrasions, burns, and cuts. 2 x Absorbent, Cotton (1 Oz.) For sponging blood and cleansing the skin, for swabbing the eyes, nose, and throat. Additional items such as Safety Pins, Forceps, Scissors, Soap, and miscellaneous Bandages, Pads, Sponges and Disinfectants were sometimes also included. The above Kit No. 4 was probably one among a larger series of similar kits (but with different contents and numbers) distributed to U.S. Prisoners of War. It might be interesting to try and learn whether other Packages were available during WW2, and how they were numbered or identified. Top view of the Prisoner Of War First Aid Safety Kit, manufactured by Parke Davis & Company, Detroit, Michigan, U.S.A., on behalf of the American Red Cross. 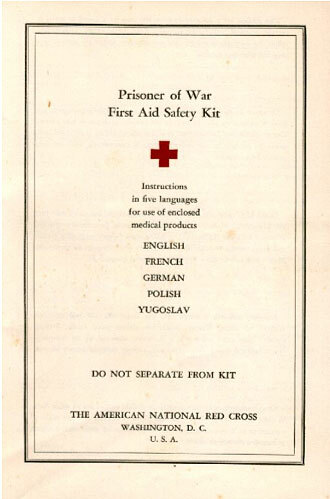 The following item is another type of “First Aid Safety Kit” provided by the “American Red Cross” for United States Prisoners of War and delivered through the services of the International Committee of the Red Cross. This particular relief package was prepared by Parke, Davis & Company, Detroit, Michigan, U.S.A. The official nomenclature of such kit was: First Aid Safety Kit. Inside the cardboard box was a 12-page booklet, which was not to be separated from the kit since it contained basic instructions for the use of the enclosed medical products. It held typewritten instructions in five (5) different languages, i.e. ENGLISH, FRENCH, GERMAN, POLISH, and YUGOSLAV. 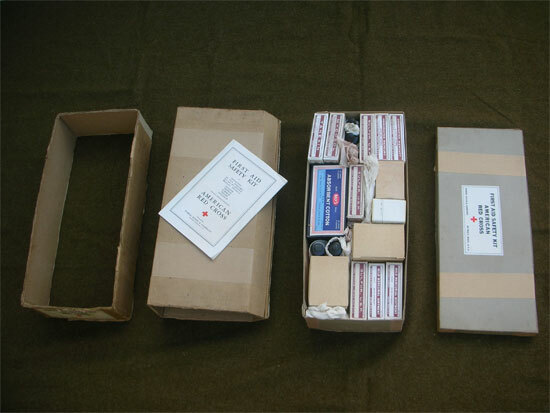 The narrow rectangular cardboard box (18” x 8” x 4”) was identified by a single white label (top) which read First Aid Safety Kit – American Red Cross – a small Red Cross – Parke, Davis & Company – Detroit, Mich., U.S.A. The cardboard sleeve also carried an identical white label at one end only. View illustrating the different components of the First Aid Safety Kit – American Red Cross, as manufactured by Parke Davis & Company, Detroit, Michigan, USA. 1 x Absorbent Cotton (4 Ounces) > For sponging blood and cleansing the skin. Rolled into small pledgets it is especially useful for swabbing the eyes, nose, and throat. 2 x Phemerol Topical (1 Fluid Ounce) > An antiseptic and germicide; effective on minor cuts, abrasions and certain skin infections; uses similar to tincture of iodine. (2 x separate dropper covers). 2 x Gauze Sponge > A folded piece of gauze; useful as a swab to cleanse dirty wounds or as a sponge to absorb pus, blood, mucuous, etc. (replaced in box by 2 x Economy Pads, Absorbent Gauze 20/12, 3″ x 3″, 16 Plies). 1 x Adhesive Plaster (3 Inches by 5 Yards) > For holding dressings in place and to give support). 1 x Ready-Bandages (100 1-Inch Sterilized Ready-Bandages) > A ready-made adhesive compress for dressing small cuts and wounds. 1 x Sodium Bicarbonate (500 Compressed Tablets) > Taken internally for gastric acidity. Dose: 1 or more tablets. Used externally as a cleansing wash in infections, burns, hives, and skin diseases. 1 x Pill Compound Cathartic (500 Brown G.C. Pills) > A mild laxative. Dose: 1 or 2 pills. 2 x Yellow Oxide of Mercury Ointment (1/8 Ounce Tube) > An antiseptic ointment useful in eye infections. 1 x Boric Acid Powder (3 Ounces) > Solutions are useful as a dressing in burns, scalds and wounds; also as a dusting powder in skin diseases. Solutions are effective as eye lotions or as a wash for ear and nose infections. 4 x Blue Ointment (1 Ounce Tube) > An ointment for destroying “crab” lice; also effective in certain skin diseases. (also designated Mild Mercurial Ointment). 4 x Sulfur Ointment (1 Ounce Tube) > An ointment for parasitic skin diseases such as scabies (“the itch”). 1 x Tanexin (1 Ounce Tube) > A tannic acid jelly for the treatment of burns. Easily applied over burn areas. (also designated Tannic Acid Burn Ointment). 1 x Mycozol (1 Ounce Tube) > For the treatment of fungus skin diseases commonly referred to as “athlete’s foot”, “ring worm”, “dhobie itch”, “summer itch”, etc. (also designated Fungicide Ointment). 2 x Ammoniated Mercury (1 Ounce Tube) > An antiseptic ointment especially useful in certain skin diseases. 4 x Boric Acid (1 Ounce Tube) > An antiseptic ointment for burns, wounds, fissures, abrasions, etc. 2 x Aspirin (500 Compressed Acetylsalicylic Acid Tablets) > For relief of aches and pains (headache) and the reduction of fever. Dose: 5 to 15 grains; 1 to 3 tablets. 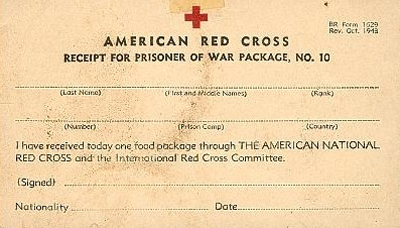 Illustration showing the American Red Cross Prisoner of War Food Package No. 10. 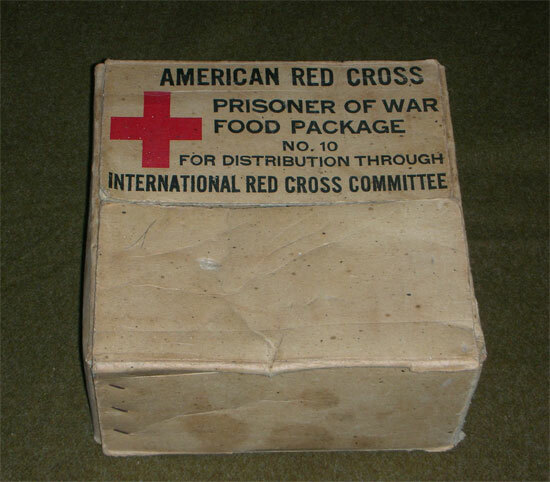 As indicated in our introduction, another type of relief package was the one designated AMERICAN RED CROSS (Red Cross symbol) PRISONER OF WAR FOOD PACKAGE NO. 10 FOR DISTRIBUTION THROUGH INTERNATIONAL RED CROSS COMMITTEE. According to the “Quartermaster Foundation”, the A.R.C. asked the Quartermaster Corps for a suitable Food Package destined for Prisoners of War. The basic specification, produced in cooperation with the relief organization, listed a number of potential food items, as well as accessories such as paper towels, can openers, vitamin capsules, salt, and tobacco, and even a sundry unit including buttons, needles, thread, and patching cloth. Illustration showing the reverse side of the ARC Receipt Card for a Prisoner of War (Food) Package No. 10. Packing specifications requested that the individual package weigh not over 12 pounds, and that the shipping case not exceed 50 pounds, with good keeping quality under adverse storage conditions. Prisoners were invited to return a “Receipt for Prisoner of War Package No. 10” to the American Red Cross (ref BR Form 1629, Rev. Oct. 1943). 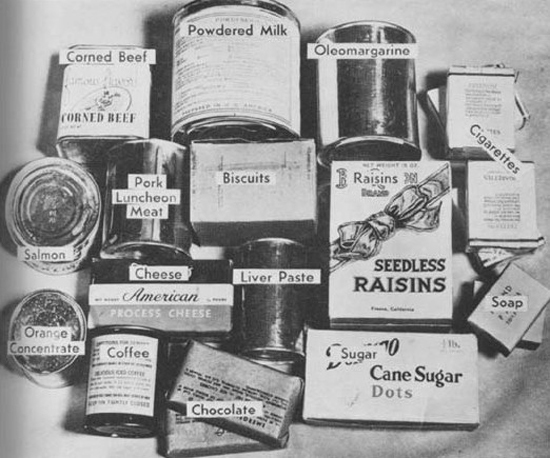 Contents of the Prisoner of War Food Package No. 10. With help and support from the I.R.C.C., national Red Cross societies were able to arrange exchange of ill and severely-wounded prisoners, inspection of PW camps, and delivery of mail, food and medical packages to prisoners. 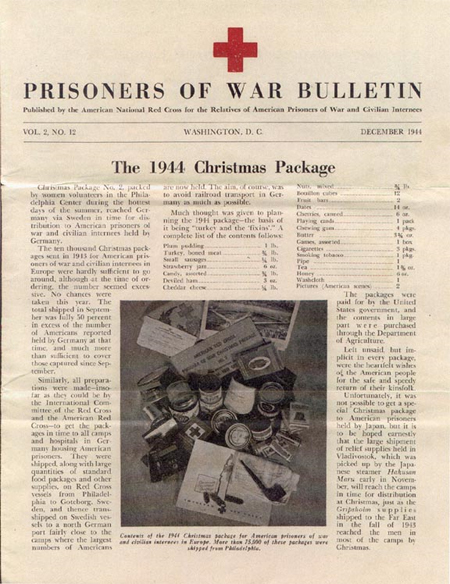 In addition to the above, special packages for invalids, Christmas packages, and printed bulletins (non-war events) were also sent to the prisoners. 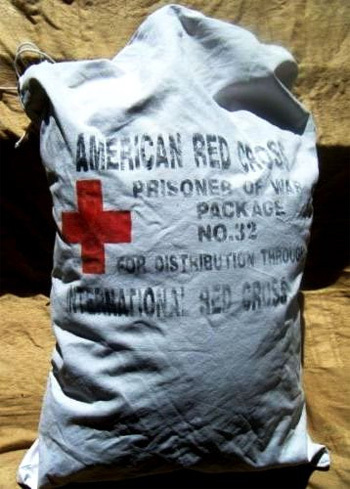 Red Cross food parcels were mostly shipped by the United States, Great Britain, and Canada to provide some comfort and help overcome food shortages in PW camps. The packages were sent from the country of origin to central collection points in neutral countries, or directly to Geneva, Switzerland, from where they were loaded onto railway cars and shipped to the different enemy PW detention camps in Germany and other European countries by the International Red Cross Committee. 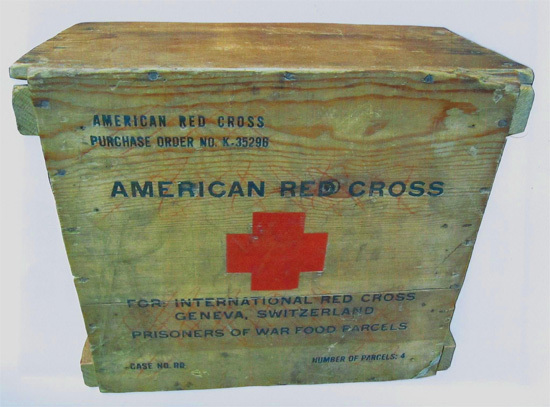 Illustration of the outer wooden crate containing four (4) American Red Cross Prisoners of War Food Packages No. 10. Illustration of ARC Prisoner of War Package No. 32 (could this bag be the one containing clothing ?, maybe one of our readers could help us with this). Due to shortages, PWs were sometimes compelled to share the contents of such parcels. Products such as cigarettes became interesting items for exchange among prisoners and were also used to bribe German guards. It must of course be said that entire packages or some of their contents were sometimes pilfered by the German personnel, especially toward the end of the war. It should be noted that other Allied Nations (such as Britain and Canada) also participated in relief operations, supplying packages to their own Prisoners of War. Out of interest, the authors are looking for information related to the other belligerents, Allied or Axis powers, conducting similar WW2 PW Relief programs. Thank you. Illustration showing the ARC Prisoner of War Food Package No. 10 and the ARC Prisoner of War Medical Kit No. 4.